Elios is the first collision-tolerant drone, designed for the inspection and exploration of the most inaccessible places. 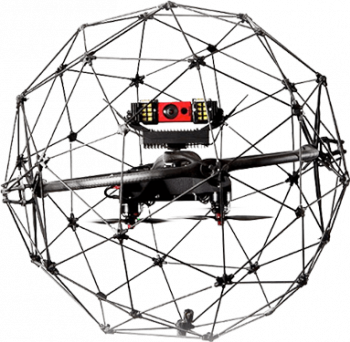 Allowing for the first time to fly in complex, cluttered or indoor spaces, Elios unleashes the potential of UAVs in numerous applications where their use was previously too dangerous or simply impossible. Inspired by the ability of insects to keep their stability after an in-flight collision, the flight concept of Elios is the result of hundreds of millions of years of natural evolution. Using a unique and pragmatic approach, Elios solves the biggest challenges of flying drones indoor in complex and confined spaces or in contact with humans: the risk of collisions and injuries. Privileging tolerance to collisions over the attempt to sense and avoid obstacles, Elios provides the level of reliability that is expected by professionals operating in environments where failure to operate is not an option.